Back pain is one of the most common symptoms we treat at Denver Physical Medicine & Rehab, and it is also one of the most common complaints among adults in the United States. In fact, as many as 90 percents of people experience low back pain at some point in their lives, and it is one of the top causes of disability among adults under the age of 45. Nearly 20 percent of the population experiences pain in the back during any given year. Back pain is the second most common reason for doctor appointments. The third most common reason for hospital admissions is back pain. 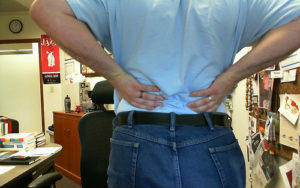 The causes of back pain are numerous, and sometimes they can be difficult to pinpoint. In most instances, it occurs as the result of overuse, strain or repetitive injury. Many people experience back pain as a result of stretching and lifting. Lifestyle factors, such as poor posture, obesity, and chronic stress, can also be contributing factors. Back pain may also be caused by medical conditions, such as sciatica, ruptured discs, osteoporosis or arthritis. Since nearly everyone experiences back pain from time to time, it can be difficult to determine when it is necessary to seek treatment for your symptoms. Minor pain that subsides on its own within a few days is generally of little concern, but there are instances in which you should reach out to a Denver back specialist. If you are experiencing back pain that is severe and is showing no signs of improvement after several days or is having a negative impact on your normal daily activities, we advise you to contact us at Denver Physical Medicine & Rehab. At Denver Physical Medicine & Rehab, we have a multidisciplinary approach to treating back pain. We begin with an initial consultation and evaluation, and based on our findings, our team creates a comprehensive treatment plan consisting of various therapies. Your treatment plan may include physical therapy, chiropractic care, massage, and other techniques. We believe that by combining the expertise of medical doctors, Denver physical therapists and chiropractors, we are able to create treatment plans that address the root of the problem and provide long-term symptom relief. To take the first step toward achieving freedom from your back pain, contact the Denver back pain specialists right here at Denver Physical Medicine & Rehab. Call 303-757-7280 to schedule your free consultation. After you make your appointment, try these 3 back pain relief tricks.